A number of developers have been let go from the OnRush studio at Codemasters. That's according to Eurogamer, which reports that the Cheshire-based developer has seen a number of staff laid off including director Paul Rustchynsky. Eurogamer sources say that the developer has been "decapitated" with firings made at all levels of the studio. Additionally, those who haven't been let go have been asked to reinterview for their positions. "It is normal course of business for game teams to evolve as projects launch and move into service, and as other new projects start," a Codemasters spokesperson said. "As such, it isn't appropriate to comment on day to day movement of staff changes." The outfit was formerly Evolution who made PlayStation 4 exclusive DriveClub. It was shut down by Sony and subsequently picked up by Codemasters. 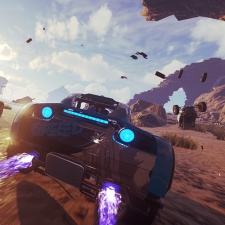 Its debut game, OnRush, launched at the start of June but failed to make a dent in the market. Codemasters reasoning for these layoffs seems somewhat disingenous. While it is normal for a developer to change staff as a project comes to a close, this is far less common now given how most titles require longer-term support. So, for 'normal' staff to go would be surprising, but not out of the question. But a game's director being given the boot suggests larger problems with the project. Though it reviewed well, OnRush appears to have not been a massive commercial success, something that is likely a larger reason for Rustchynsky being laid off. A PC version has been pencilled in for later this year, but we have no idea whether this has been affected by the layoffs. We've reached out to Codemasters for clarification.